This cozy room is equipped with one single bed. If you travelling alone, it suits you the best. 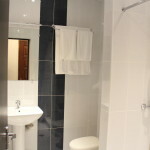 The budget single rooms are all equipped with a separate bathroom with toilet, bath and/or shower, and hair dryer. 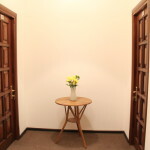 In addition, these rooms include air conditioning, which is very important for our guests. This room comes with free high speed internet connection, LCD flat screen TV, radio, telephone, personal safe, work desk with chair and lamp, large mirror, minibar, and free coffee and tea facilities.